Of the few reviews of my first mini-published novel, wonderful as they all are and thankful to each reviewer that I am, this one strikes the cleanest chord with me, and so I humbly offer it here. The author of the review has asked to remain anonymous for a couple of reasons, none to eschew posterity, but for publishing and business caveats I of course will respect, much as I would love to boast about his or her identity. The nature of addiction is cyclical. It goes round and round; get the stuff, use the stuff, come down from the stuff, need the stuff, get the stuff. T J Brearton’s novel Rehabilitation (not really his first, apparently, but the first to be pushed out of his cave and into the world) is a book that knows this carousel of addiction all too well. That is not to say the book has a revolving door plot. The merry-go-round is a handy metaphor, but when combined with the telling, the nature of addiction is revealed within the narrative, as our anti-hero Jack Aiello (aka “Number 0035”) heads towards his inexorable end in his circuitous way. It’s true, Jack often comes back to the same points, but we witness as he gradually develops an awareness of these points, and gains the good sense that something is quite wrong. The book then, is meta. It is both a challenging narrative about genetic science fiction, and a meditation on the nature of addiction. This meditation is couched in the prose, in the structure of the book itself. Divided into three “books,” or parts, we first journey with Jack as he begins his mission hunting down a missing person while he struggles to stay sober. In this opening act, we uncover the commune which is the first of a series of portals Jack passes through as he travels down the rabbit hole. In book two, we’ve gone back with Jack eight years to his time spent in Costa Rica, in service of the same criminals who’ve sent him on the missing person quest in book one. Here we discover the origins of the technology that Jack encounters in book one, only with Jack, we discover it indirectly. Everything Jack experiences is colored by his scrim of perception. Whether in active-addiction-mode or in post acute withdrawal, Jack tends to skew off course; he’s anxious, paranoid, and filled with delusion. Even once he’s quit drinking, Jack still behaves like a wind-up toy with a broken leg; he has yet to atone for the sins of his drinking life (“stomping on George Klembeck’s head with a bottle of vodka in my hand” is one of the lines). Jack’s “steps” are his journey to find the missing nephew of these criminal brothers he works for, these surrogate fathers (his own father died when Jack was a boy after his mother had left). This, of course, is not real recovery, not real rehabilitation, but that’s the point. Here, the genetic science fiction part steps in, attempting to manufacture the healing Jack so craves. While this may be galvanic to the plot, it’s open for debate whether it is essential to the real story. What results is a book that, while it may or may not serve a broad enough demographic to be a best seller, and while in its rawness may not be the most polished, masterful work Mr. Brearton will ever do, has one irrefutable asset: Its authenticity. 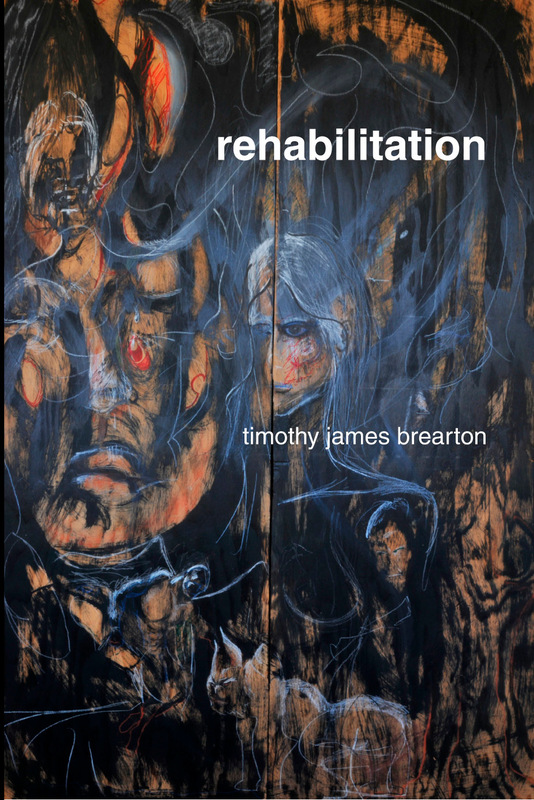 There’s no doubt in my mind Brearton poured himself into the writing of Rehabilitation. There may be some points he held back just a little, but like any good chef knows, it’s as much what you leave out of the dish as what you put in. 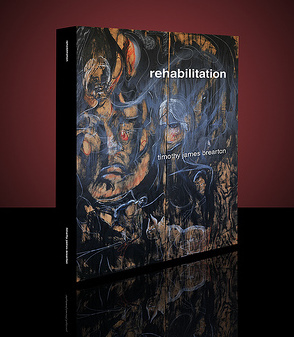 The book shines with this meta-level of story telling; the style of writing is itself part of the story (its written in the first person, an “epistle,” as Jack himself describes it), the story is both about addiction and recovery, the cover of the imprint I have is some of Brearton’s own artwork (he also paints) and…. You get the picture. If there’s anyone who may appreciate this little tarnished gem more than others, it’s going to be those people cut from the cloth of the author himself, and people like his alter ego, Jack Aiello. People who maybe think too much, drink too much, and who wonder at hidden realities in the world around them. It should also be an appealing, even fascinating read for those who work in the humanities; therapists, social workers, teachers of the arts and sciences should get a kick out of this mind-bending melodrama. It’s dark, it twists and turns, it doubles back on itself, it sweats with doubt one minute and bites with confidence the next, just like, I have no doubt, many patients, clients, and students do. 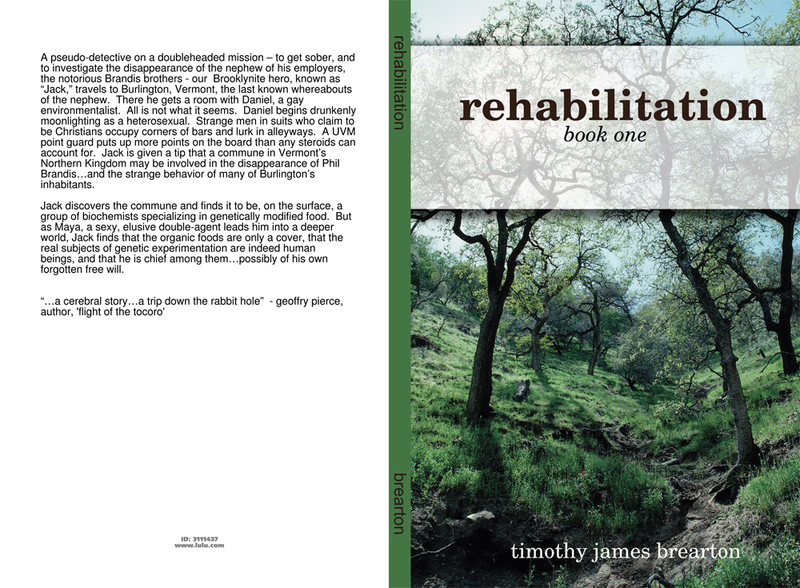 Within the pages of Rehabilitation lies something a bit more than a three-act story, but an aching for truth and redemption. In this way, the book is full of more humanity than many I have come across before or since.